Recap: Seattle-based Allen Institute for Artificial Intelligence (AI2) has introduced their Pictionary-playing AI named AllenAI. Unique to other gaming AI, AllenAI relies on human interaction and context clues to both guess what a drawing is supposed to be, and draw accurate depictions of complex concepts. AI2 hopes their revolutionary AI can serve as a sandbox for other experiments meant to give bots common sense and the ability to reason. Today, the Allen Institute for Artificial Intelligence in Seattle (AI2) debuted AllenAI, a robot that can play a Pictionary-like game called Iconary. 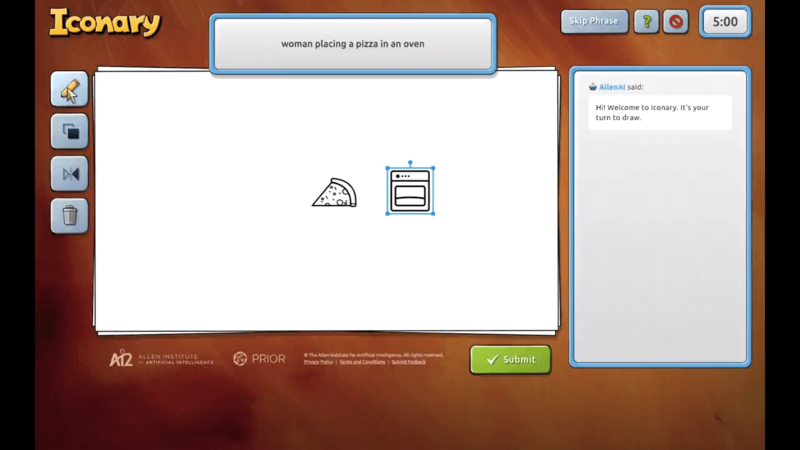 The AI is able to both guess what humans are drawing as well as draw something of its own and allow humans to guess. The latest in a series of game-playing bots, AllenAI has so far played over 100,000 rounds of Iconary and is able to recognize over 1,200 unique concepts. Unlike other AI systems, AllenAI does not learn through repetition. Instead, the AI depends on collaboration with a human in order to succeed at the game. This give-and-take collaboration is a unique concept in that traditional AI use games to make "neuron" connections, basically creating massive datasets and learning through studying patterns. Iconary is being used in an attempt to teach AllenAI context instead of simple game strategy. For instance, AllenAI may be asked to draw a crowd of people celebrating. In order to accomplish this, the AI has to understand the concepts of a human form, a crowd, and emotions that convey celebration. This requires the AI to "think" and interpret more than just a pre-loaded image to either convince a human player, or understand what a human player is drawing. In order to accomplish this, AllenAI is using Google's Quick Draw dataset, which is comprised of over 50 million drawings (and is a great time killer). The AI converts the human drawing into a symbol, which is then matched against the Google database. AI2 project lead Ani Kembhavi explains the choice of Iconary over traditional video games by relating it to real-life concepts. Kembhavi and his team refer to AllenAI as a "research sandbox" and believe that the use of Iconary will teach the AI common sense and the ability to reason. While this AI isn't expected to give robots the gift of sentience, AI2 hopes that the data it collects will be useful for future bots. Imperative to their mission is keeping humans in the loop. Pitting AI against AI in Iconary would "develop a communication protocol that only it knows,” according to Kembhavi. Take comfort in the fact that, for now anyway, AI still needs humans in order to understand our world.